SolarHub is a complete lighting and power kit in a box! 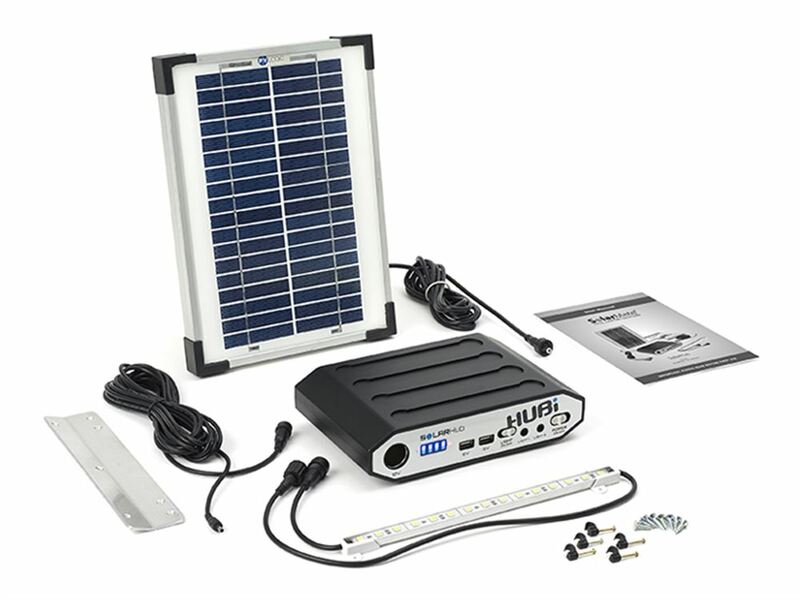 The all new Solar Hub lighting kits provide easy to fit lighting and power for stables, workshops, sheds, garages Ð in fact anywhere there is no grid connection. It also allows you to charge up your phone, or even your laptop and fans if you get the larger kit. Using a high efficiency Solar panel, an advanced lithium battery hub and super bright 300 lumen led Strips / bulbs the SolarHub kit is enough to illuminate a workshop or stable block of up to 8m x 8m with the large kit and 4m x 4m with the standard kit. Exempt from Part P of the Building regulations, SolarHub can be easily and safely installed by anyone. Totally plug and play, the complete system takes no longer than a few minutes to setup and install with no special wiring knowledge or tools needed. The SolarHubs solar panel will collect enough energy during the course of the day (even in Britain) to power its bulb for between 2 and 7 hours every day of the year (2 hours in the winter Ð 7 hours for the rest for the year based on the 3w LED bulb). We say: this is such a simple solution and makes life that much easier, especially during the shorter days. You really can hook it up in 10 minutes and it is very reliable.